This is probably the first Valentines Day that we have actually gone out on Valentines Day. 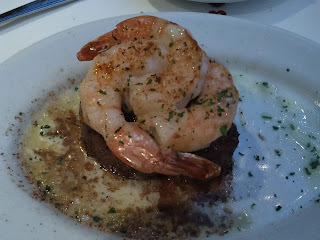 It so worked out that Alona's parents could watch the children on that day and so, we decided to explore the Ruth's Chris that recently opened about 5 minutes away from our house. 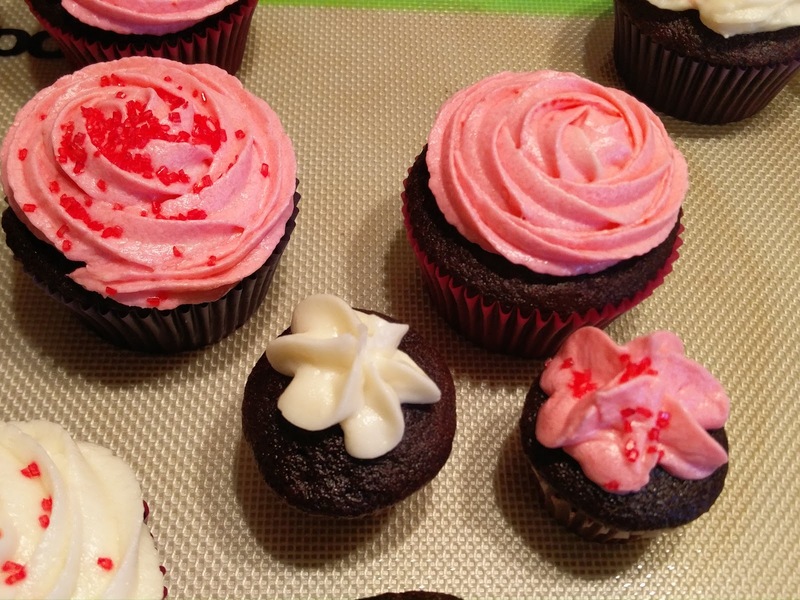 First, Alona and Kaspian and Astrid made cupcakes in the morning to celebrate Valentines Day. Kaspian was staying home from school due to still not feeling too great with strep. He requested that the cupcakes be red. (To him they are still red - we did put red gel food coloring in the frosting after all!) It was just a Krusteaz cake mix for the cupcakes and simple buttercream frosting. Alona's getting much better at piping decorations and much faster at it too! 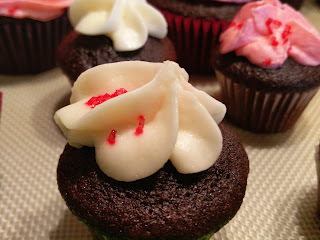 The cupcakes turned out moist and delicious..even though there is something wrong with our red gel food coloring, we have the Wilton's food coloring and even though it hasn't been too long since we bought them it appears the red color has sort of dried out. The other colors still seem more "gelly". Anyways, on to our Ruth's Chris dinner. We decided to try the 3 course dinner as it allowed for a greater sampling and having never been there before (Nick has gone, but it has been over ten years, so let's not count it!) we wanted to try the most things. We did order an appetizer of the calamari. Nick loved it, and Alona thought it was good, although a little too sweet for her tastes. 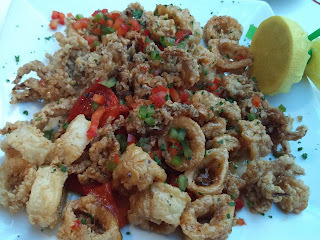 And honestly...at $18, we have tried better calamari - but this was all for the experience. 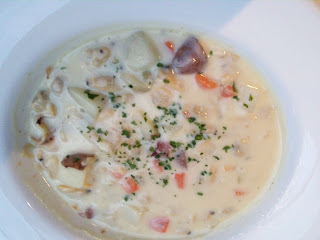 Next, Alona decided for the Clam Chowder which was unlike any clam chowder we have ever tried. It was more soup-y or bisque-y than clam chowder. 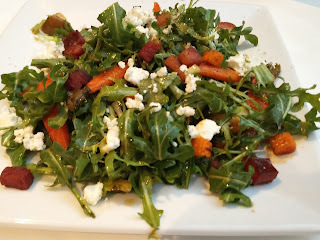 Nick went for the Farmers salad...which we have agreed was the best thing we tried there. Next, Alona opted for the Filet and Shrimp, while Nick decided on just the Filet Mignon. 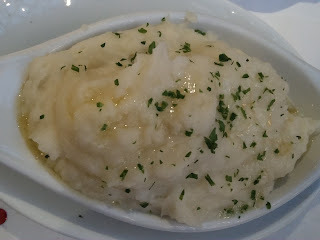 We chose fingerling potatoes and mashed potatoes for our sides. The sides were... sad. We make far better mashed potatoes. They almost tasted like they came out of a box. 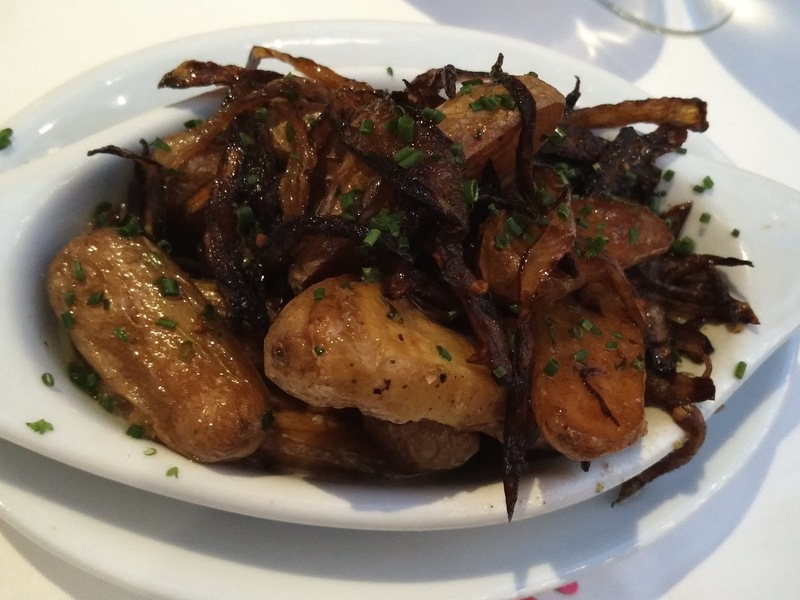 And for the fingerling potatoes - they were pretty much impossible to eat as they were soaked in oil. However, the fried onions were a really great touch. 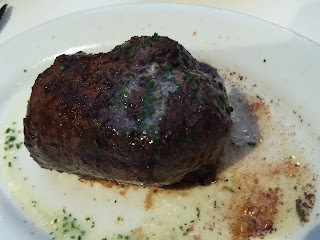 The steaks were served on super hot plates and we were warned they were 500F plates..we are a bit skeptical on that account, but they were sizzling. The cuts of meat were amazing. They were cooked just as we ordered...but really, they were not the best we've had, they really lacked a sauce to accompany them. In comparison, Vernon's Steakhouse has a far superior steak. 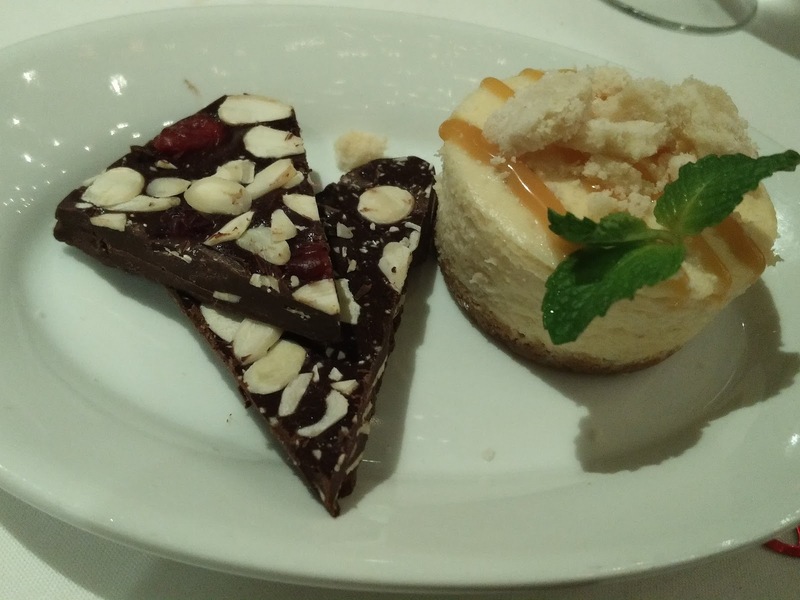 Finally, for the desert, we did not get to pick it was an apple pie cheesecake tart and some chocolate ganache with cranberries and almonds. It was really nothing spectacular but overall pretty good. We really enjoyed the experience of going out on Valentines Day, but we probably will not be back to this place.